Based in Mumbai, India, we, Prime Steel Tech (I) Pvt. Ltd. are serving the numerous requirements of construction industry. Our consistent efforts, hard work, dedication and professional attitude enable us to become a renowned Cuplock Fittings Manufacturer. The customers can buy our whole gamut of Cuplock Fittings, Cuplock System, Adjustable Beam Span, Construction Scaffolding Systems, CUPLOK Scaffold etc. in different specifications. 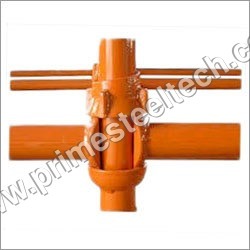 The Cuplock Fittings are are mainly used in assembling of scaffolding. Compact size, easy to fit, dimensional accuracy, excellent finishing and resistant against corrosion are some of its features. Besides, we are a customer focused company which leave no stone unturned to fulfill their needs in an effective manner. In order to attain maximum client satisfaction, we are also providing customization facility in the whole assortment. Copyright © 2019-20 by PRIME STEELTECH (I) PVT. LTD. All Rights Reserved.